W x Gusset x H: 21" x 4" x 30"
Compare to Uline S-5857 and Save! 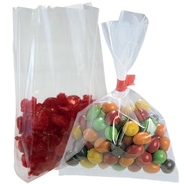 21" x 4" x 30" dry cleaning bags are made with hanger holes and sloped shoulders and come on a roll for easy dispensing. Plastic Dry Cleaning Bags are good for protecting skirts, pants and common wardrobe items. These bags have a warning that reads, "WARNING: TO AVOID DANGER OF SUFFOCATION, KEEP THIS PLASTIC BAG AWAY FROM BABIES AND CHILDREN. DO NOT USE IN CRIBS, BEDS, CARRIAGES OR PLAYPENS."